DNA stands for deoxyribonucleic acid, and it is the carrier of genetic information within a cell. A molecule of DNA consists of two chains that are wrapped around each other. The chains twist to form a double helix in shape. Each chain is made up of repeating subunits called nucleotides that are held together by chemical bonds. There are four different types of nucleotides in DNA, and they differ from one another by the type of base that is present: adenine (A), thymine (T), guanine (G), and cytosine (C). A base on one of the chains that makes up DNA is chemically bonded to a base on the other chain. This bonding holds the two chains together. Additionally, there are base pairing rules that determine which bases can bond with each other. Adenine and thymine form base pairs that are held together by two bonds, while cytosine and guanine form base pairs that are held together by three bonds. Bases that bond together are known as complementary. 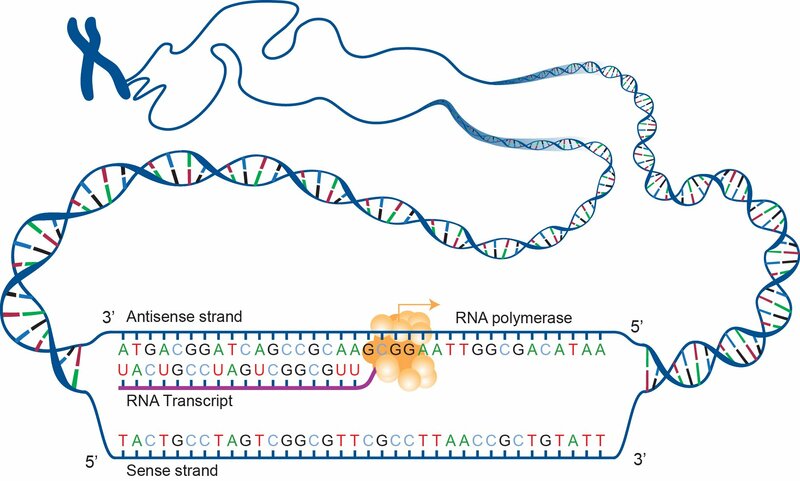 During transcription, DNA is converted to messenger RNA (mRNA) by an enzyme called RNA polymerase. RNA is a molecule that is chemically similar to DNA, and also contains repeating nucleotide subunits. However, the “bases” of RNA differ from those of DNA in that thymine (T) is replaced by uracil (U) in RNA. DNA and RNA bases are also held together by chemical bonds and have specific base pairing rules. In DNA/RNA base pairing, adenine (A) pairs with uracil (U), and cytosine (C) pairs with guanine (G). The conversion of DNA to mRNA occurs when an RNA polymerase makes a complementary mRNA copy of a DNA “template” sequence. Once the mRNA molecule has been synthesized, specific chemical modifications must be made that enable the mRNA to be translated into protein. During translation, mRNA is converted to protein. A group of three mRNA nucleotides encodes for a specific amino acid and is called a codon. Each mRNA corresponds to a specific amino acid sequence and forms the resultant protein. Two codons, called start and stop codons, signal the beginning and end of translation. The final protein product is formed after the stop codon has been reached. 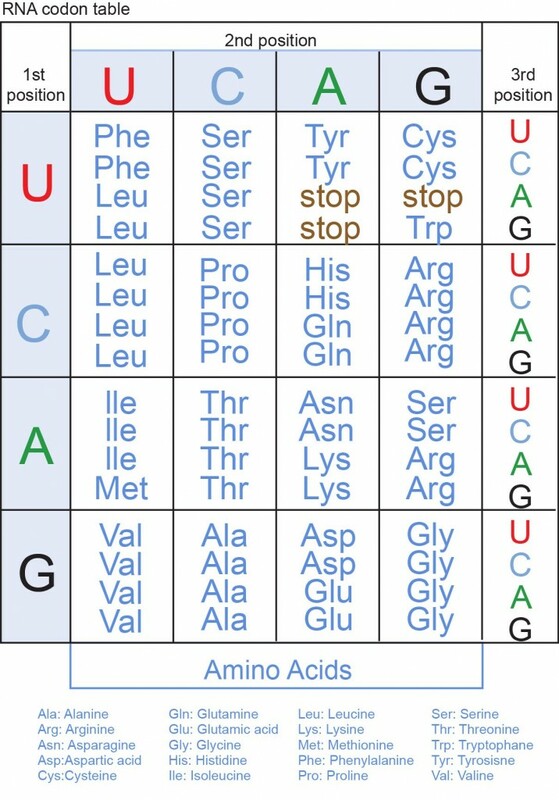 A table called the genetic code can be referred to in order to see which codons encode for which specific amino acids. Several of the codons end up encoding for the same amino acid, a process that is referred to as redundancy in the genetic code.